For such a tiny kitty, Matoki made quite a journey to get to Anya Lewis’s house in Brooklyn, NY. A Washington, DC, cat rescue had found her at an open admission shelter and had placed her in a foster home in Baltimore. From there, the 5-month-old kitten made the transition to Purrfect Pals in East Hanover, NJ, which listed her on Petfinder. Matoki served as a role model for a litter of once-feral kittens. 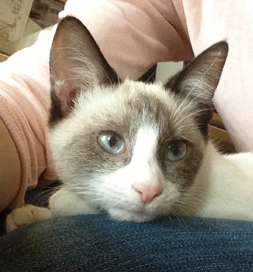 Anya Lewis had never heard of Snowshoe cats before she saw Matoki on Petfinder, but it was love at first sight. The losses touched her deeply, but eventually she was ready to open her home and heart to another little soul. Matoki was going to be at an adoption event the next day, and Anya, wanted to be there. “I recruited a friend who likes to drive,” she says, “and rented a car to make the trip.” Matoki, came home with her that day, and it didn’t take long before the kitty seemed to understand that this new place was her forever home. Soon Anya would have a chance to pay forward the goodness of the people who had helped Matoki. “About a month after adopting her, I discovered a litter of kittens just old enough to be weaned in a feral cat colony on my block,” she says. She took the kittens to the vet and quarantined them briefly and then began introducing them to life indoors. Matoki was a partner in the learning experience. While still in their cage, she says the kittens would line up, watching, while she and Matoki played some of the games cats and people play together. “It was as though they were spectators at, say, a tennis match,” Anya says. “When I began letting them out of the cage for short and closely supervised periods, they would relieve themselves in any random corner,” she says. As soon as they could be out longer, “they watched Matoki and followed her and soon figured out that the only acceptable place to go was in her box — and they never made mistakes after that.” Matoki also groomed the kitties and snuggled with them. The once feral kittens have found permanent homes now, and Anya looks forward to volunteering as a foster for a local rescue group. Of course, she’ll have a little help: Matoki is a natural.